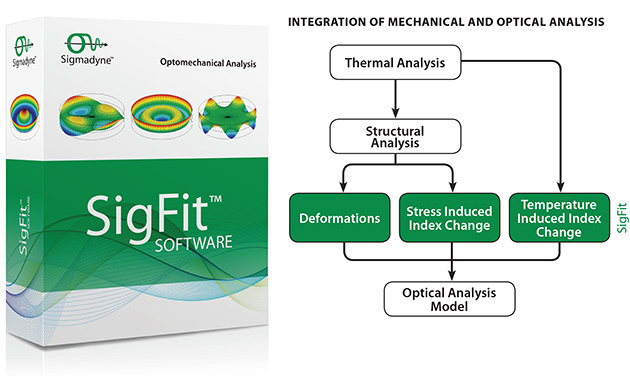 SigFit allows optomechanical engineers to integrate mechanical analysis with optical analysis. This allows calculations of optical performance predictions that include the effect of mechanical disturbances while leveraging finite element and optical analysis software already familiar to the user. SigFit has many other features as well including simulation of adaptive control, variational analysis using Monte Carlo methods, and calculation of line-of-sight error. Supported operating systems include Windows® 7 32-bit, Windows® 7 64-bit, Windows® 8.1 64-bit, and Windows® 10 64-bit.